Summer Challenge Pillows: A three way tie! Welcome to the Proper Bostonian Quilters official blog about our Guild's activities and all things PBQ. The goal for this blog is a monthly post with additional posts for special events. The first meeting of the 2015-2016 year was September 9, 2015. There was a great turnout on a very sultry summer like evening. To keep guild members sewing during the summer when we don't have meetings there is a Summer Challenge project. This summer is was making pillows which will be for sale at the Boutique Table at our Quilt Show, November 6-8, 2015. What a great assortment of pillows! It was a challenge choosing just one favorite for the voting. And the result? A three way tie! Congratulations to winners (clockwise from upper left) Daryl , Jeannette and Maureen! Well done! The guild is busy getting ready for the show November 6-8, 2015. Posters and postcards are ready for distribution (see photo above and Show Chair Lady Ann and Guild Co-President, Janet discussing the up-coming show). 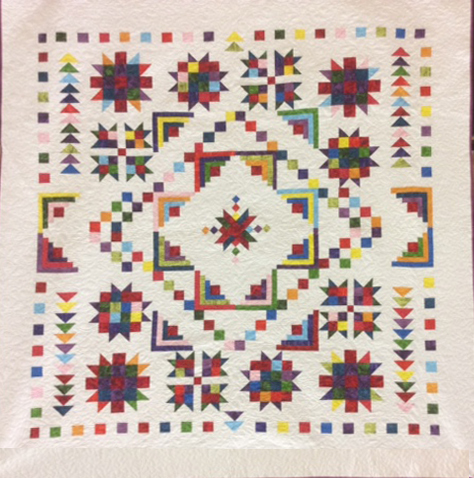 All quilt entries need to be in by September 23, 2015. With the quilt show in mind, members will be showing demonstrations to the guild. Here are some of the scheduled demonstrations. If you have one you would like to give, please give a shout out! The Guild's Media team has had a busy summer. In addition to this beautiful new website, we now have a Facebook Group just for members and an Instagram site! Facebook: Proper Bostonian Quilters. If you joined the Facebook group this summer, you will need to re-join now. To link the FB site with this new website, we needed to take down the group we created this summer and make a new one. Sorry of the inconvenience. Thanks for signing up again! Instagram: ProperBostonianQuilter Instagram is a photograph based social media site much loved by creative folks, including quilters. It uses the same hashtags # as Twitter. People on Instagram have an @ in front of their name. Photographs by a group or on a similar subject use the hashtag symbol. If you are posting photos about quild, or have questions about a project you are working on and want advice from a member use this hashtag. #properbostonianquilters (Do NOT use #PBQ or #ProperBostonian. Those hashtags are being used by other groups not related to the guild. Thanks)! If you are taking photos about or at our November quilt show use the hashtag #PBQquiltshow2015. Here are some fun hashtags to explore if you are new to Instagram. #quilting. #freemotionquilting #modernquilting. You can see Instagram on a computer but you need to get the free app from the iTunes Store or Androids Playstore to post. This is a tablet and smartphone friendly application. Check it out. It's lots of fun. Explore our new website. It has a lots of information including schedules for the year, information about committees, a blog posting photos from our monthly Show and Tell and information about the upcoming show. Here's a photo of the Quilt which will be raffled at the Quilt Show. There's a smaller version for a drawing among guild members who sold tickets. Great job everyone who made a block, and a great big THANK YOU to Maer and Martha for assembling and quilting this masterpiece! Looking forward to seeing you at our next meeting. And if you are a member currently away from the Boston area, please follow all activities on this website, Facebook and/or Instagram.